France : When and where to go? France has a temperate climate, influenced by marine inputs on the west coast, more continental in the center and east, and south Mediterranean and of course on the Mediterranean coast. The seasons are usually very marked, with cold winters, warm summers and dry-seasons and neat and punctuated by rain events. The rugged terrain of the area adds to the general climate of local variations: cold winters in the mountains, spring and autumn and warmer on the sunny Mediterranean and Atlantic coasts, precipitation anarchic on the tip of Brittany, sometimes scorching summers in Alsace, for example. Depending on the region you choose different seasons to visit France, but knowing that winter is probably the least favorable period, unless you want to practice winter sports: the Alps and the Pyrenees know a good snow often early in the month of December, which lasts until March or April, and allows attendance pleasant ski holiday to the winter break. Stations of the Massif Central and Jura they can offer a nice alternative if the snowfall is significant. In spring and autumn, the edges of the Mediterranean enjoy mild temperatures and sunshine better than the rest of the country in September and October are ideal months to discover Corsica example. For the rest of the country, summer brings the guarantee to meet the weather in most areas crossed, but a crowd of tourists on the roads and sites for tourists, especially on beaches. Of France has many attractions both natural and cultural history. Open sea and ocean, animated by numerous mountain ranges, dotted with villages and preserved, it is not for nothing the most visited country in the world. Paris alone requires several days of excursion: its monuments, the Eiffel Tower to the Opera, the Arc de Triomphe and Notre-Dame, or the Sacred Heart, to name a few , museums, the Louvre in the City of Sciences and the Centre Georges Pompidou, its old neighborhoods, the Marais, Montmartre, its gardens of the Tuileries in Luxembourg, its luxury shops, department stores, will give you the opportunity to stroll and make exciting discoveries to suit your mood and your curiosity, never be disappointed. 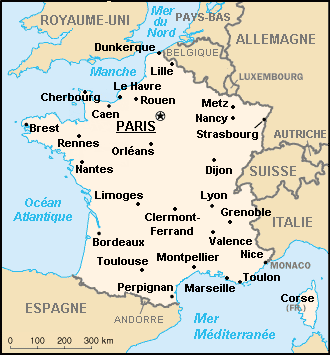 Each French region has particular features which make it a miniature country. Brittany will seduce you with its wild coastline battered by the winds, cut into rocky coves or granite cliffs, moors and fragrant mysterious islands. A little lower, Aquitaine, between the Atlantic and foothills of the Massif Central, you will pass the caves of Lascaux, where you talk about prehistory, the beautiful beaches of the Landes with its giant waves, until its Béarn nestled in greenery foothills of the Pyrenees. Continuing east, Languedoc-Roussillon, between the Pyrenees and Rhone valleys and spreads her sweet life, among fountains and hills, beaches and cities in the shaded squares. Then you arrive in Provence, bulls and horses to admire, villages with Roman tiles, and you are lulled by the chirping of cicadas and the smell of pastis. Go back into the Alps to find the needles and glaciers, crossing the paths of the parks to achieve the altitude lakes shining in the sun and a halt in the picturesque hilltop villages. History lovers are sure to visit the famous castles of the Loire, Sancerre, Chambord, Chenonceau, Blois, Amboise, wonders embedded in the lush landscapes peaceful and harmonious throughout the quiet river. Despite the limited area of its territory, France would probably not be discovered at once, and other routes will surprise you at your next visit: Basque Country, Alsace, Auvergne, Cevennes, Picardie, each region has its treasures, its cooking and its accent! Two international airports, Paris-Charles de Gaulle and Nice, serving the French territory. It is also very easy to access by road from Italy, Germany and Scandinavia. The Eurostar and the Channel Tunnel to Paris are two hours from London. The euro is the currency in circulation. The budget you will spend on your accommodation and your food is obviously a function of comfort level, but also on the season and your resort. The cuisine is a French tradition recognized, you will have no trouble finding many schools cooking regional specialties at prices quite affordable if you avoid the tourist areas too: a meal at 15 € is possible even in the middle season in some villages of Quercy or in the heart of the Pyrenees, providing paths to deviate too crowded. Regarding accommodation, there is a hotel portfolio covering all price ranges, but also many campgrounds classified by level of comfort and cozy cottages and welcoming that compete heavily with the hotels. Count still about € 70 for a double room in summer, prices could easily double in the big cities. Travel within the country may be in the process, but the car is recommended to access all the wonders hidden corners of campaign served only by road. In large cities, metro and tram are very convenient and the bus systems and style Vélib 'are increasingly in place, very pleasant and inexpensive to go to discover the city to its pace.